Modern India is a mélange of voice, a medley of images, a swirling, sweeping energy in a perpetual motion of change. Listen and you might pick out a familiar word here or there. The cadence of a popular film song may come your way, or your memory jostled by the whisper of a half-forgotten phrase. The fragments of language are ephemeral, elusive, as though a gigantic Jigsaw puzzle has scattered its pieces over the subcontinent. Hindi, Bengali, Tamil, Punjabi surface far away from their habitual domains as writers and their audience, publishers and translators cut across traditional boundaries and the country celebrates its many languages, one literature. At Home in The World captures the mood of this new cultural space. Believing that the inscriptions of a language are as much visual as aural, this multilingual text offers a tribute to the resonance of India's multiple voices. Further, it encourages readers to recognise their own multilingual capabilities and actively engage with the regional work and its translation. 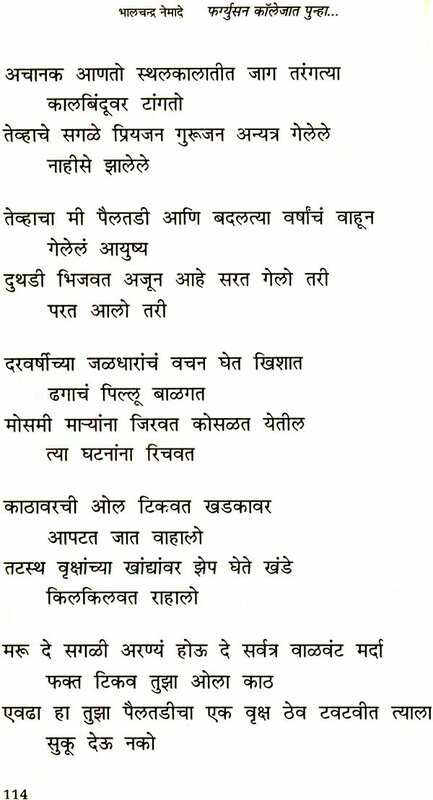 While most of the selections from bhasa have been rendered here in English, as a unique experiment some reputed English writing has been specially rendered into bhase. An extract from The God of Small Things has been translated into Hindi for the first time. Vikram Seth sounds excitingly different in a non-English medium. From the editorial viewpoint, English is one among the languages of post-independent India. Though the literary marketplace grants certain privileges of international outreach for books published in English, we believe that the regional languages can gain substantial attention by extending to audiences in other parts of our country too. Does such multilingualism shape into a portrait of the nation? Encapsulated in these pages are vignettes strangely captivating in their commonalties as well as differences. Family relationships are a paramount subject and the life cycle from birth to death, a matter for candid reflection. Krishna Sobti from the northern belt of Punjab and Paul Zacharia from the southernmost state of Kerala choose elderly protagonists. The imperious Ammi demands fine foods, fresh air and a chair I the balcony-never mind the bedsores. The "mad" uncle Thommachen mischievously plays a film song, "chand ko kya maloom", during a funeral gathering. The young have their passions of the body beautiful-seductive, exploitative, often self-destructive. Mahasweta Devi's story of the nameless "girl" linking tribal communities to the controlling power of state institutions is not unlike Tendulkar's version of the exploitation of Gauri by Ghasiram Kotwal. Caste hierarchies and ritual practices have never ceased to fascinate the Indian literary imagination. Among the classics is U.R. Anantha Murthy's Samskara, the furtive spiritual journey of a flawed priest. 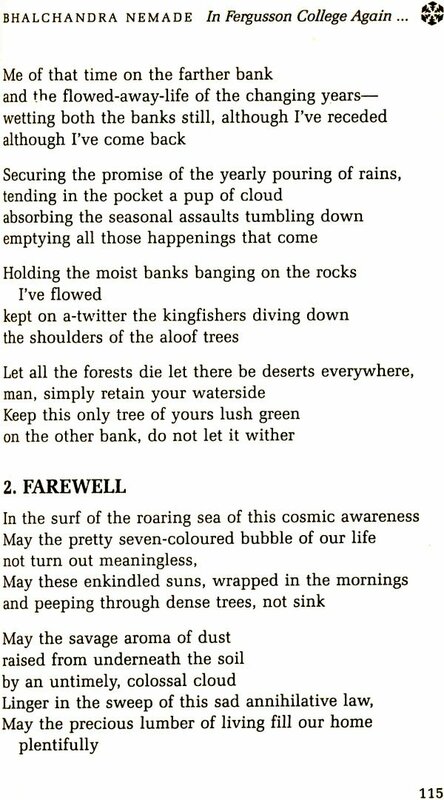 Paralleled by Ramakanta Rath's invocation to ancestors and M.T. Vasudevan Nairs's Frieze from the Mahabharata, the interrogation of an ancient system remains a strong contemporary impulse. The troubling question of the local and the global is implicit in a collection such s this. Chandrashekhar Kambar picks out folklore and "untold stories" around the river Ghataprabha in the Belgaum district of Karnataka, explaining the rubrics through foot notes on Naagini and Gowda. Other poets, K. Satchidanandan, Keki Daruwalla, Dilip Chitre, Nirmalprabha Bardoloi prefer to let images evoke their variable impact, however "distant" the references to Kazan and Cherdyn or Tao temples may seem. Allusions to more dominant strains in cultural knowledge such as the stories about Radha and Krishna, Shiva and Nandi, enjoy a freewheeling symbolism for most readers. Kiran Nagarkar's Cuckold, relying upon the common availability of Mira's legend turns history another way by foregrounding the viewpoint of the neglected husband. Such playful irreverence for tradition lets Sunil Gangopadhyay fill in juicy gossip about Rabindranath Tagore's infatuation for his sister-in-law Kadambari Devi and have Bhalchandra Nemade compare Purusha and Prakriti to a "huge generator." Quite apparently the sentimental display of pain and poverty is no longer the stuff of Indian literature. Nabaneeta Dev Sen's ironic glance at Oxfam blankets for the poor is offset by the obsessive display of food, clothes and jewellery satirized by other writes. The traditional female preoccupations deserve to be debunked and demystified. Halwa-puri-kheer-pua-pokora, craves Ammi; Annapoorna, true to her name, gives up music lessons to cook elaborate meals for her husband. Sardarnis flaunt their "shimmering clothes" and "glittering ornaments." This is the soil, this is the milieu, the contemporary writers from or diverse languages remind us emphatically. The joy and poignancy have a location and name in the particularity of a tongue, a grammar, a region, which through the medium of translation enlarge their audience. The introductory comments are merely pathfinders through a volume, which is primarily meant for delight rather than instruction. India is a nation state but Indianness is not a homogenous term. Plurality, difference, diversity co-exist within secular principles. Languages can divide people, but they can also unify if the habitual multilinguality of Indians is endorsed and enhanced by the culture industry. This anthology is a modest sample. At home in the world captures the mood of a new cultural space. Believing that the inscriptions of a language are as much visual of aural, this multilingual text offers a tribute to the resonance of India's multiple voices. Further, it encourages readers to recognize their own multilingual capabilities and actively engage with the regional work and its translation. While most of the selections from bhasa have been rendered here in English, as a unique experiment some reputed English writings has been specially translated into bhasa. This unique collection of contemporary creative writing contemporary creative writings in a multilingual text format brings alive the plurality and diversity of Indian literature. Among the classics is U.R. Anantha Murthy's Samskara, the furtive spiritual journey of a flawed priest. Mahasweta Devi's story of the nameless "girl" linking tribal communities to the controlling power of state institutions is not unlike Tendulkar's version of the exploitation of Gauri by Ghasiram Kotwal, or Nabaneeta Dev Sen's ironic glance at Oxfam blankets for the poor. Poets, K. Satchidanandan, Keki Daruwalla, Dilip Chitre, Nirmalprabha Bardoloi prefer to let images evoke their variable impact. Kiran Nagarkar's Cuckold, relying upon the common availability of Mira's legend, turns history another way by foregrounding the viewpoint of the neglected husband. Such playful irreverence for tradition lets Sunil Gangopadhyay fill in juicy gossip about Rabindranath Tagore's infatuation for his sister-in-law Kadambari Devi, and have Bhalchandra Nemade compare Purusha and Prakriti to a "huge generator." The joy and poignancy of this writing has a location and name in the particularity of a tongue, a grammar, region, which through the medium of translation enlarges its audience.